Apple wins its first domain arbitration case of the year. Apple has won a dispute over the domain name aplestore.com as a World Intellectual Property Organization panel ordered the domain name transferred to the iPhone maker. The typo of AppleStore.com was registered to a man in Poland and forwarded to a parked page full of ads. This is the first case Apple has won under the Uniform Domain Name Dispute Resolution Policy (UDRP) this year. But several other cases were resolved prior to the UDRP panel handing down a decision. 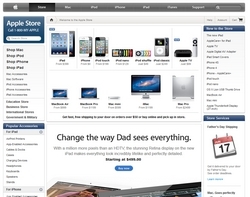 Most notably, it took control of iPhone5.com last month shortly after filing a dispute.